Last Friday, thanks to Sean, our Raleigh sales representative, I had the opportunity to test-ride the upcoming 2011 model of the Raleigh Competition road bike. 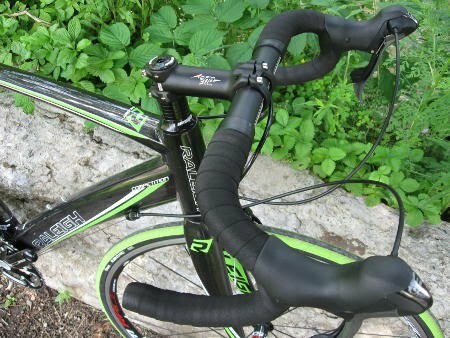 This bicycle has a frame made of Raleigh's high-modulus monocoque carbon fiber, including the fork with 1-1/2 inch to 1-1/8 inch tapered steerer tube. 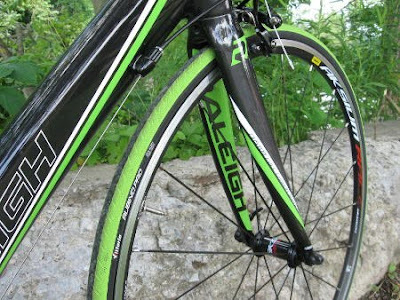 The natural carbon color is highlighted with neon green accents, along with matching 700x23 Vittoria Rubino Pro tires. The drive train is anchored by Shimano's 10-speed 105 group, including the shift/brake levers, front and rear derailleurs, chain, and cassette, rounded out with an FSA compact double (50/34) crankset and chainrings, with the new BB30 oversized bottom bracket system. The handlebar is the aluminum FSA Wing Compact model with ergonomic flat tops. The rest of the cockpit is put together with Avenir 200 Series aluminum stem and seat post, topped off with a Selle San Marco Ponza saddle. 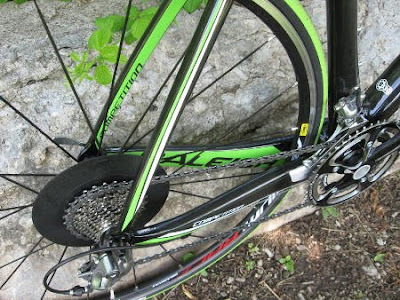 Stopping power is provided by Tektro Dual Pivot brakes. The whole package rides on Mavic's Aksium Race wheelset. The bike weighs in at 17 pounds, 14 ounces (55cm frame, without pedals). 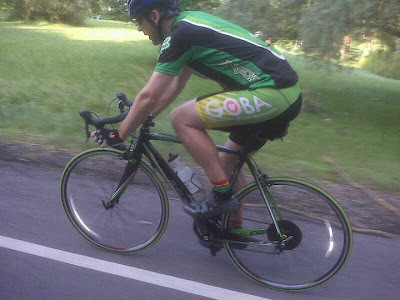 So, here I am putting it through its paces heading south on Akron-Peninsula Road (by the way, it was sheer coincidence that I ended up wearing a matching jersey/shorts kit). Doug, Sean, and I finished the Valley Loop, then Sean and I headed further north for some hill work (up Boston Mills Rd, down Columbia Rd, up Snowville Rd, then down through the Brecksville Reservation, and back home on Riverview Rd); about 40 miles total. So, how did it ride, you ask? 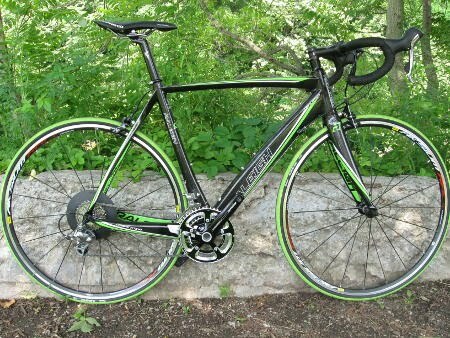 First off, let me point out that this was my first real ride on an all-carbon bike (other than quick parking-lot test rides), so my main point of reference is to my steel and titanium road bikes. One of the first things I noticed was the sound, or I should say the lack thereof. Some carbon frames have a tendency to transmit and amplify noise from the road, as well as from the chain and cassette, but I heard none of that on the Competition. If I would have had to guess, I would have picked a 57cm as the ideal size for me, but surprisingly, the 55cm test model fit perfectly fine; I was able to get a good leg extension without jacking the seat post way up over the frame, and my forward reach felt ideal for racing and fast, aggressive riding. The carbon frame did its job. It felt smooth and supple when cruising along, but stand up and hammer on the pedals, and you get out of it what you put into it. It's a real point-and-shoot piece of machinery; on the downhill S-curves of Riverview Rd, I found myself leaning into the curves more than usual, and tapping the brakes less than usual. The Shimano 105 shifters gave fast, clean shifts whether up-shifting or down-shifting. Remember that with trickle-down technology, the 105 of today is as good as the Dura-Ace of a few years ago. The compact double crankset gave me plenty of gears to handle the climbs of the valley. The compact double concept has become quite popular and works very well for most weekend riders. Serious racers, however, may find that they run out of gears on the high end and would prefer a standard double (53/39). At $2,599.99, the Raleigh Competition provides a good value to anyone looking for a race-worthy full-carbon road bike. You get solid brand-name quality in the wheels and drive train, and save a few bucks with generic labels on some of the lesser-noticed parts (brakes, stem, seatpost). If you must have a little more "bling" in your ride, the Raleigh Prestige and Raleigh Team share the same carbon monocoque frame with the Competition. At $3,249.99, the Prestige gives you a full SRAM Force drive train, including a SRAM Force 53/39 crankset with BB30, and an alloy FSA seat post and stem, and FSA carbon handlebar. At $5,499.99, the Team gets you Mavic Ksyrium SL wheels and a full SRAM Red drive train. In my experience with a compact double (on the Giant Defy Alliance), I was missing gears at the top end and at the bottom end that I had more of with my triple. In fact, the only fault I had with the Defy Alliance was the compact double system. I just didnt feel it had enough gears for me. I dont know if it was psychological or really physical. I didn't try to climb Boston Mills West with the Defy, though. Maybe I should have. That's interesting that you felt like you ran out of gears on both the low and high end with a compact double. My experience with my compact double (on my Surly Cross-Check) is that I have the high and low I need, but I have the impression that I'm shifting between the small and big ring up front a lot more often compared to a triple or standard double. I think it's because the range of most-often-used gear combinations straddle the high end of the small ring and the middle range of the big ring. It took some getting used to at first, but it's not a big deal to me now. If I were doing fully-loaded touring, I would still want a triple for getting all that weight up the mountains, but for fast riding, light touring, and commuting, I have been very satisfied with the compact double.